With Sydney School of Entrepreneurship officially launched in August, NSW is now Australia’s entrepreneurial hotspot for students. The school offers tertiary students across New South Wales the chance to embrace an entrepreneurial mindset and skills. The Deputy Premier, Minister for Regional New South Wales, Minister for Small Business and Minister for Skills John Barilaro, has been one of the NSW government’s biggest supporters of the school and officially opened the Sydney School of Entrepreneurship (SSE) campus in a packed opening ceremony. The establishment of SSE comes hot on the heels of the State government’s launch of the Sydney Start-Up Hub in July, cementing NSW’s place as the innovation centre of Australia. Start-ups and innovative small businesses are the engine room of jobs growth in NSW. Net jobs growth over the past decade has come from the 6% of companies that start small and grow quickly, meaning these investments in training the next generation of entrepreneurs are protecting our collective economic future. The inaugural CEO of SSE is Nick Kaye. CEO Nick Kaye with Deputy Premier, Minister for Regional New South Wales, Minister for Small Business and Minister for Skills John Barilaro at the Sydney School of Entrepreneurship launch. Nick is Australian but has spent 20 years abroad and the past decade running the prestigious Stockholm School of Entrepreneurship, honing the craft of (as he refers to it) ‘applied entrepreneurship’. “We absolutely believe an entrepreneurial mindset can be taught,” he said. SSE is a partnership between twelve tertiary institutions across NSW – 11 universities and TAFE NSW. Students can apply to attend SSE as an additional unit which will be recorded on their transcript. There are no additional fees and the School offers mobility scholarships to help regional students attend any city-based sessions. The units of learning will be a combination of online and in person, on campuses across the state. The pilot unit is called The Navigator and is designed as an introduction to the entrepreneurial ecosystem: how to craft a concept, how to present to potential investors, who those investors might be, how to partner with other organisations, and so on. It will connect its student entrepreneurs with business owners and international resources with the knowledge to help them start-up, scale up and innovate business. “The Navigator is designed to help students who have a great idea understand how they can take it to the next level. There are networks and organisations we have access to that would be almost impossible for them to connect with otherwise. We can set them on the path to entrepreneurship,” said Nick Kaye. As a school teaching entrepreneurial thinking, SSE doesn’t use a traditional lecture theatre format. Instead, the Ultimo-based campus features a flexible building that can be adapted and used for everything from intimate one-on-one mentoring through to visiting entrepreneur presentations to 250 people. The program of co-curricular activities includes workshops, hackathons, educational boot camps and networking events. When fully operational, at least 1,000 students each year will participate in SSE courses and activities. 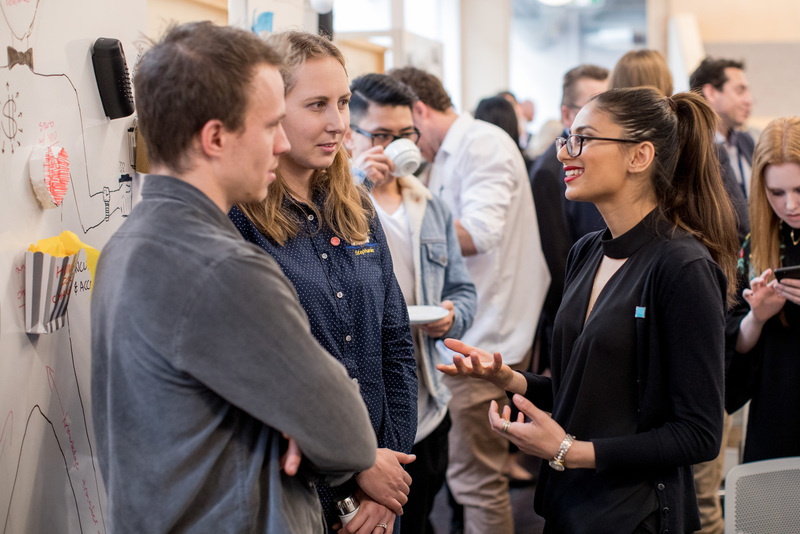 The first cohort includes student entrepreneurs from all 12 members across multiple locations, including eight University of Sydney undergraduates from the fields of law, commerce, design computing, international and global studies, and engineering. Nick Kaye stresses that having an entrepreneurial mindset is not all about launching the latest tech start up. “It’s the mindset we’re teaching – a mindset that can be applied in even the most traditional of industries. It can apply to a new way of practicing law, dispensing medicine or building a bridge just as easily as it can to the next social media platform or sharing economy idea,” he said. In fact, the first intake of students includes a mix of those studying law, botany, medicine, design, technology, engineering and more. New South Wales undergraduate students are encouraged to visit the SSE website and apply at any time during the year. Unlike traditional learning units, SSE will operate on a rolling basis, meaning there are intake opportunities constantly throughout the year. Inspiring Australia (NSW) will host a Commercialising Science forum at the SSE campus on 16 October as part of Spark Festival 2017.